Toss salads, mix batters, or display fresh fruit in Bruce Larrabee's handmade set. Grandma's hand-me-down bowls—cracks and all—appeal to the vintage romantic in you. But the epicurean in you will fall in culinary love with Bruce Larrabee's handcrafted set. Beginning with a fresh slab of clay, Bruce throws each piece, paints in his signature drip glaze, and kiln-fires at 2,400 degrees. The result is a set that's worth its weight in beauty and function. Toss salads, mix batters, or display fresh-picked fruits with these bold accents. Handmade in Park City. Since his first ceramics class in high school, Bruce Larrabee knew he wanted to create pottery. He went on to recieve his BFA from The University of Utah, and has been making unique clay pieces ever since. 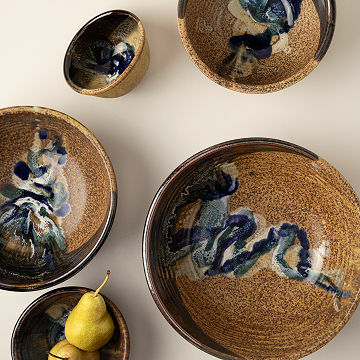 Bruce's designs are known for their fluid glazes, which are bold in color and evoke moving water. When he's not glued to the wheel, you might find him playing with his grandchildren, fixing up an old Mustang, or relaxing on a beach in Hawaii. He lives creates in Park City, Utah. XS: 2.5" H x 4.75" diameter; 8 fl. oz. capacity; 0.35 lbs. S: 2.75" H x 5.75" diameter; 16 fl. oz. capacity; 0.4 lbs. M: 3.25" H x 7.25" diameter; 32 fl. oz. capacity; 0.75 lbs. L: 3.75" H x 9" diameter; 64 fl. oz. capacity; 1.2 lbs. XL: 4.25" H x 11" diameter; 104 fl. oz. capacity; 1.53 lbs. Use these both for everyday prep as well as for serving. Both for family and guests. Love them. I never do reviews, but was shocked to see no reviews for this product yet.